TWENTY months on from their reformation, the hard working backbone of St Duthus Football Club can look back with fondness at a period which has brought many successes. The principle aim of getting the club onto a sound footing has been achieved. A committee was formed and it has maintained its efforts solidly throughout last season and into the next. Off the field, the club has been blessed to have received the support of many volunteers who have given up their time to assist with the running of the club. A substantial amount of work has been completed on our club pavilion at the Links to bring it up to the standards required for senior football, and that is thanks to a good amount of fundraising carried out by everyone last season. Improvements thereafter have been made with thanks in no small part to Robert Chatten, who as well as helping out on matchdays, has taken great pride in the presentation of the pavilion and the football park itself. Greenkeeper Craig Phillips of Tain Golf Club has also been vital in ensuring our playing surface is well maintained - a difficult task when using a public park. Matchday sales have raised hundreds of pounds for club funds through the sale of raffle tickets, match programmes and other merchandise on a Saturday afternoon. In our tea hut, our volunteers have done well to ensure supporters and visiting committee are kept fed and watered, an offering that has been complimented this season by the added quality of homemade pies prepared by Bruce MacIvor of Sweet Celebrations. Key events in the club's social calendar have been well attended. Our Texas Scramble and Sportsman's Dinner were both a success during 2016-17 and were boosted by regular fundraising through initiatives such as the 21 Goals sweepstake, regular street stalls and the now annual Tesco cycle challenge. The Saints committee have followed the pattern again this year, and plans are already in place for a second annual Texas Scramble in November, and their second Sportsman's Dinner in February. A new 100 Club lottery was initiated in April and in August, a successful race night was held, and there are plans to hold another before the end of the football season. The icing on the cake has been the club's attainment of the Scottish Football Association's Quality Mark Standard award -- achieved in recognition of the committee's attention to improving and supporting coaching, development structures, administration and planning, and above all, it shall be seen as a welcome reward for the passion and determination shown to steer the project forward. Chairperson Niall Harkiss and Treasurer Dale Finlayson will attend a presentation at Pittodrie Stadium to collect the club's award in November. Indeed, the Saints are back on the map and the club is in a good position. 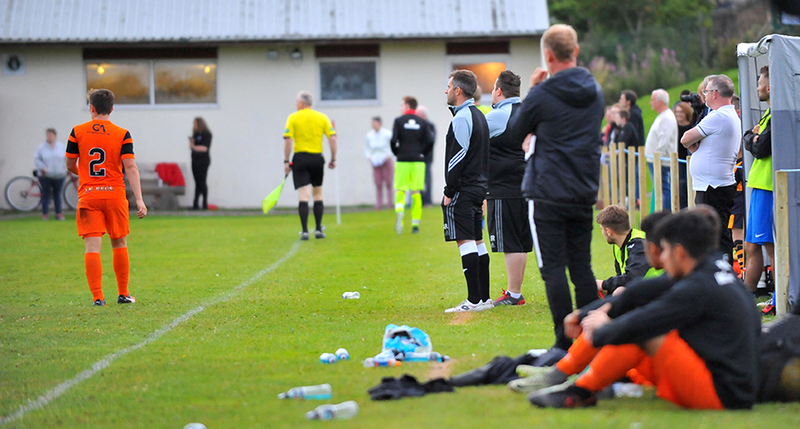 On the park, Stuart and Andrew Ross now embark on their second season as the management team behind St Duthus. They have locked horns with several clubs from across the Highlands and Islands thus far and the team has attracted praise from rival teams and supporters alike. Although, it didn't seem as though that would be the case so soon. Stuart recalls the humble beginnings from which the team emerged. Seven weeks before the season started we had just seven lads at training, some of whom were just there looking to raise their fitness and had little intention of playing. If you'd told me at that stage that we would go on to secure a mid table finish and play in a showcase Jock Mackay Cup final at the end of the season, having recorded wins over in Orkney and up at Thurso along the way -- I'd have bitten your hand off. It took us a couple of months but we got there and in the process we have built the foundations of a strong community club which can now grow. Our first season was an undoubted success in terms of re-establishing the club as a name within the North of Scotland football landscape. I'm very proud of what we have achieved. Team wise, we feel this squad is good. It's a nice sized squad with a good blend of experience and youth. We have competition for places right throughout the squad which can only be a healthy thing. There are a close knit group too, and when that translates on to the park it is a joy to watch and to be a part of. This second year though, is all about trying to improve on that -- striving to improve our league position and aiming to win a cup. We've come close already to reaching a final, and I think anyone who watched us a fortnight ago will agree that we were unlucky against a very good Lewis & Harris side. Our next step is to engage once again with the community to ensure that there is a natural pathway that footballers can follow, from the early teen years into senior football. It has always been our mantra since the day we started this, that we want to ensure that nobody should have to leave Tain to play their football, and now that our first team at St Duthus has been established, we are keen to press ahead with plans to introduce community run football for kids in their teenage years. The club are currently one of three good causes receiving tokens in a bid to benefit from the Groundwork UK fundraising scheme being run in Tesco in Tain until the end of October. From this, the club stands to receive a grant from £1,000 to £4,000, which it will use to help kickstart their plans for a youth programme. Discussions are already underway with Tain Juniors FC - the town's long serving youth football club - to put together ideas on how this can be achieved. The St Duthus FC committee would be delighted to hear from anyone wishing to get involved in the club, as a volunteer or to offer their support with any of our activities to help us achieve our aims. The committee can be contacted on committee@stduthusfc.co.uk.